Platinum is a beautiful silver grey tuxedo. Very calm and easy to work with. Platinum was sold in 2016. Willson is a Huacaya out of two gray Suris. He has a nice dark rose gray fleece. 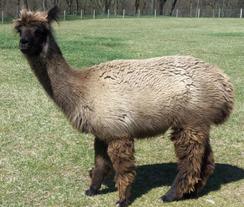 Willson's fleece is beautiful and would be great for you if you would like a nice fiber animal. Everyone loves his tufts on his ears and cute face. He leads and is gelded.